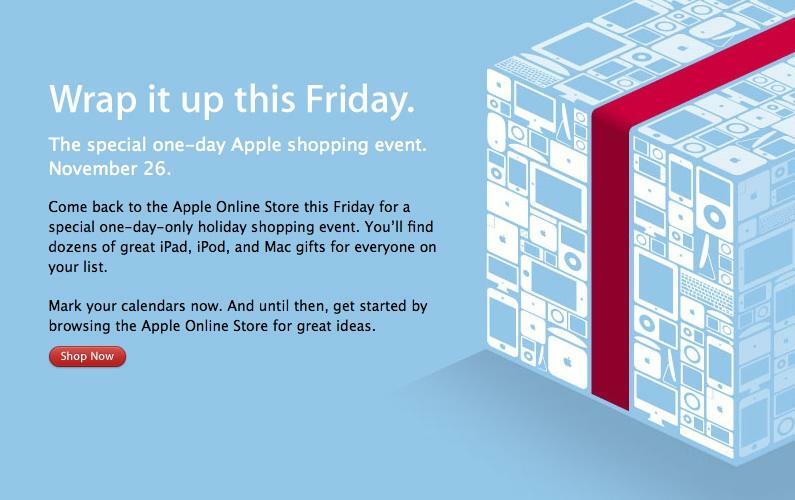 In advance of the biggest shopping day of the year, Apple has posted a teaser for a Nov. 26 Black Friday sale on its website, telling customers to come back to the Apple Online Store on Friday for a special "holiday shopping event." The teaser, which is part of Apple's online holiday gift guide, invites customers to "wrap it up this Friday" at the company's "special one-day Apple shopping event." "Youll find dozens of great iPad, iPod, and Mac gifts for everyone on your list," reads the teaser, which displays a holiday gift box made up of various Apple products. Apple has traditionally offered modest discounts on Black Friday (2009, 2008, 2007, 2006), leaving its authorized resellers to come up with steeper discounts. Last year, Apple offered $101 off MacBook Pros and iMacs, while resellers slashed prices by as much as $300. The iPad is expected to be a top gift this holiday season. According to analyst Mike Abramsky with RBC Capital Markets, Apple recently increased iPad orders in anticipation of strong holiday sales. Brian White of Ticonderoga securities believes Apple has one of the hottest product lineups ever. "We believe the most coveted gift this holiday season will be the iPad," White wrote in a note to investors.